Celebrate the lasting legacy of Frederick Douglass’s at the National Park Service’s annual Easter Egg Hunt. 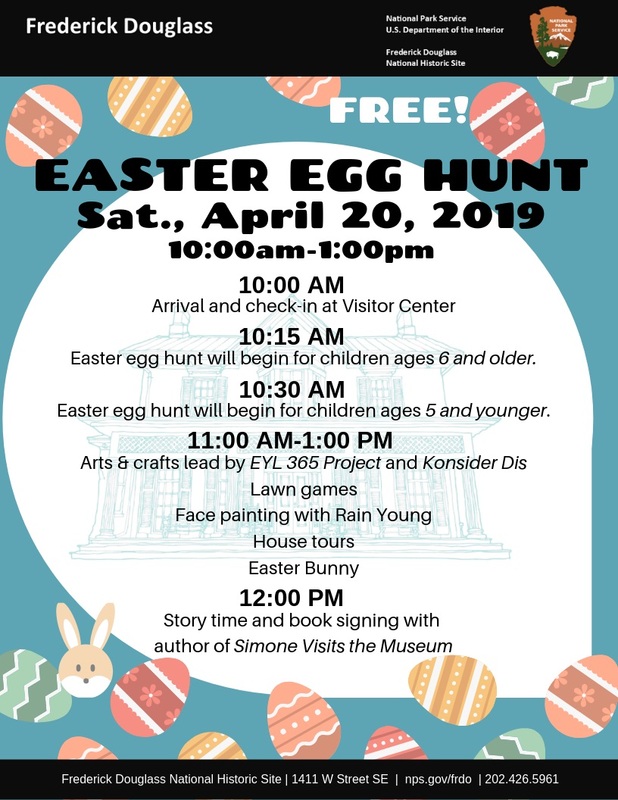 The event will take place on Saturday, April 20, 2019 from 10 am to 1 pm at Frederick Douglass National Historic Site in Historic Anacostia, Washington D.C.
At this FREE community event, children ages 0-12 will hunt for Easter eggs, take pictures with the Easter bunny, play games on the lawn of Cedar Hill, and experience the power of place with ranger led tours of Douglass’s historic home. Join in the fun with arts and crafts lead by local community organizations Konsider Dis and EYL 365 Project. Enjoy story time with Dr. Kelsi Bracmort, author of Simone Visits the Museum and DC native, and get your book signed!